Hazel Davis puts three products for normal / sensitive skin by Ayurveda Pura – a brand inspired by the ancient holistic Indian health system - through their paces. Oh oh oh! I’m in love. And it’s with a moisturiser. (That’s legal in some States, right?) 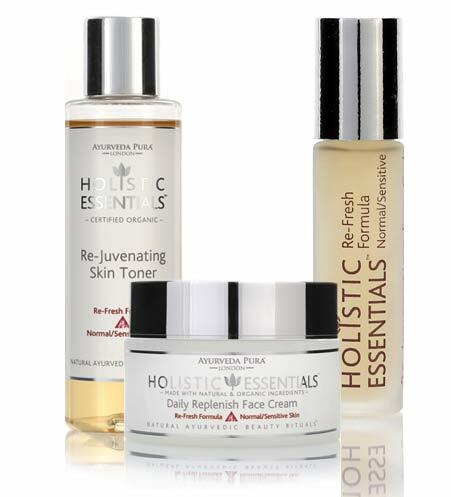 I literally can’t get enough of the Daily Replenish Face Cream (£29.13, 50ml). It’s genuinely like a skin-drink. The smell is so lovely and fresh and the texture is great. It goes on smoothly, but is substantial enough so you feel like you’re working it in. Once on, the skin feels hydrated and lush. The ingredients, aloe vera, almond, peach and essential oils (rose, neroli and orange) work beautifully together and whether it does in fact balance my pitta dosha or not, it certainly hydrates. In fact, my only problem with it is that it’s run out and the empty pot is sitting on the side of my bath looking mournfully at me and each time I open it to check whether there’s any left or scrape my nail around the bottom it makes me really depressed. Because this stuff ain’t cheap and now I am an addict! This cream works really well with the Re-Juvenating Re-fresh (£20.79, 150ml) toner. It’s a nice and simple item, with subtle scent. It’s easy to apply with a cotton wool pad and makes the skin feel suitably cleansed. The product is made with a blend of aloe vera, comfrey and floral waters. However, it’s not streets ahead of other toners I’ve tried, like the Daily Replenish Face Cream is of other moisturisers. The Rejuvenating Eye Gel (£16.63, 10ml) is the least thrilling member of the trio which I tested. In the past I have used caffeine-infused eye-perker-uppers and they have really worked – or at least they felt as if they were doing some good. This feels pretty bland on impact, but it’s not unpleasant and it smells good – it has witch hazel, and essential oils of orange, rose and neroli – and it’s a nice thing to keep in your handbag for the odd refreshing use (or sniff). For more on Ayurveda Pura’s range, click here.